Kreos Capital has invested €5m in Berlin-based online credit platform Spotcap’s series-B funding round. The fresh capital will be used to finance the company’s lending activities in Spain and the Netherlands, and to expand its operations globally. Who are you? I am Jonathan Prince, co-founder with Raoul Mulheims, Georges Berscheid and Mike Sergonne, of Digicash Payments SA which provides a digital payments platform and apps designed for banks & PSPs…Our company provides a white-labelled digital payment authorisation platform and App, fitting neatly into banks’ and PSPs’ infrastructures, using existing underlying payment channels (transfers, cards …) and smartly integrated with retailers’ POS and e-commerce systems. Success streak continues: Cashcloud wins in the category “Mobile Wallet”. Cashcloud Managing Director Olaf Taupitz: “This cannot be a coincidence!” And the winner is: cashcloud… again! The mobile eWallet of the Luxembourg start-up cashcloud was honored Wednesday in London with the FinTech Innovation Award 2015. Celent names Fidor Bank the Model Bank of the Year for 2015. The vision for Celent’s Model Bank research, now in its eighth year, is to spotlight effective uses of technology in banking. Each year, in addition to case studies highlighting initiatives within a variety of topic areas, Celent awards an overall winner. Global investment in fintech ventures tripled from $4.05 billion in 2013 to $12.2 billion in 2014, with Europe being the fastest growing region in the world, according to a new report by Accenture. Nach erfolgreich abgeschlossener Testphase startet die voola GmbH ihre gleichnamige Suchmaschine für Finanzprodukte Unter www.voola.de . Mit VOOLA will das junge Unternehmen die Suche nach den passenden Finanzprodukten vereinfachen und das große angebot für Anleger transparenter machen. Kreditech, a Germany-based lender focused on the unbanked, has suffered a data breach that has resulted in the personal records of thousands of applicants stolen and dumped on the dark web. Innotribe, the innovation arm of financial messaging network Swift, has shortlisted 60 companies from a record 370 early-stage and growth-stage startup applicants to participate in its 2015 Startup Challenge. Fidor Bank, a branchless, bitcoin-friendly German lender that adjusts some of its interest rates based on the number of Facebook “likes” it receives, plans to enter the U.S. with the help of an as-yet-unnamed American partner. German p2p lending service Lendico today added SME loans to its marketplace which previously focussed on consumer loans. This is in my view a peculiar move as now Lendico poaches in the realm of Zencap, which is already focussed on SME loans, considering that both startups were backed by Rocket Internet. Insgesamt präsentierten sich acht unterschiedliche FinTechs im Rahmen eines „Beauty Contests“, moderiert von Ralf Frank, Generalsekretär und Geschäftsführer, DVFA. Im Mittelpunkt standen dabei zum einen Ideen, die primär auf den Endkunden abzielen, wie bei Cashboard, Decimo, Fairr.de oder Vaamo Finanz….Aus der Sicht von Samarth Shekhar, Founder Techfluence.eu und Co-Founder FinTechForum DACH, sind Banken aber nicht die einzigen attraktiven Partner für FinTechs. Selbst Deutschlands Fintech-Experte André M. Bajorat hat das neue Payment-Update für Facebook Messenger mit einem „PENG!“ angekündigt. Nachdem Facebook bereits im letzten April eine kleine Banklizenz in Irland erworben hat, kommt nun das lang erwartete Update zum Messenger. Wanted! 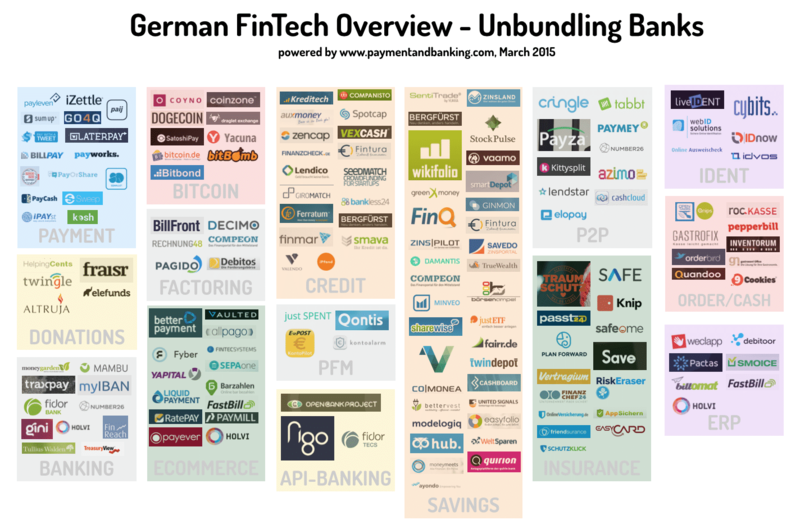 Experts on the theme: FinTechs in Germany – A threat to wealth management providers?